Recently, I was surprised by a golf movie called Seven Days in Utopia. The movie dealt with how golf is not just a game, but has an impact on our entire life. 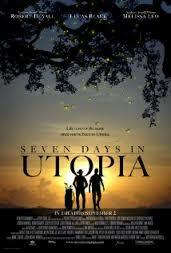 As I am always on the hunt for a good golf movie, Seven Days in Utopia is one I would watch again next winter. The overview of the move is: After a disastrous début on the pro circuit, a young golfer finds himself unexpectedly stranded in Utopia, Texas and welcomed by an eccentric rancher. Robert Duvall is Johnny Crawford and ex PGA player. He says the classic line about Luke Chisholm (Lucas Black): How can a game have such an effect on a man’s soul? The way I see it, how can it not? You don’t chose the game, it choses you. And when it does, life and golf become forever connected. That’s how it was for a young man named Luke Chisholm. I do not want to give to much of the movie away, but I do think it is worth a watch. The movie can go two ways for the viewer. As a golfer, It offers some great advice that can help anyone’s game. As a feel good movie, it talks about how the world around us affects all aspects of your game. I found the movie enjoyable. I hope you do as well! I am a grateful golfer! See you on the links…..soon! The book is better. Ow of the most thoughtful golf books I’ve ever read. Remove the religion and it would be a must read for all golfers if it isn’t already. I made my two kids watch the movie too! I will have to read the book. My wife liked it as well and she is not the golf fan I am. Overall, I think that it adds a sense of reality to golf and what some people had to do to get there! Thanks for the comments.